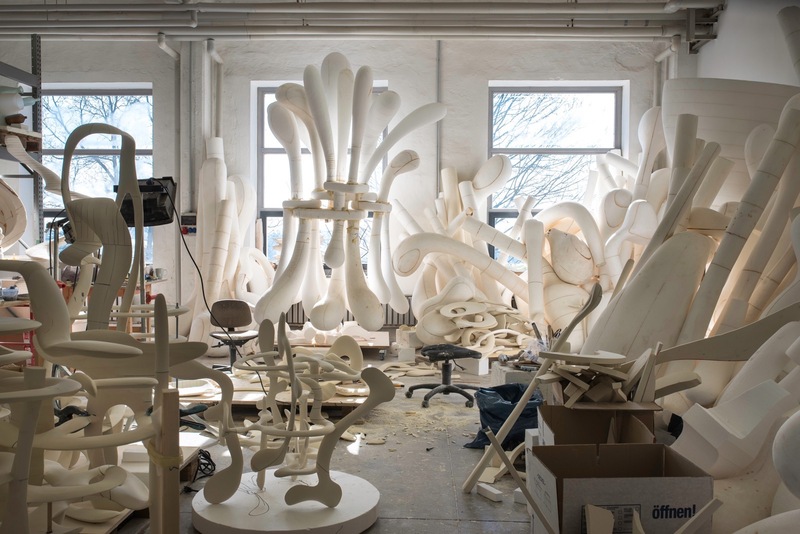 British sculptor Tony Cragg photographed in his studio. Plywood discs superimposed along a vertical axis. 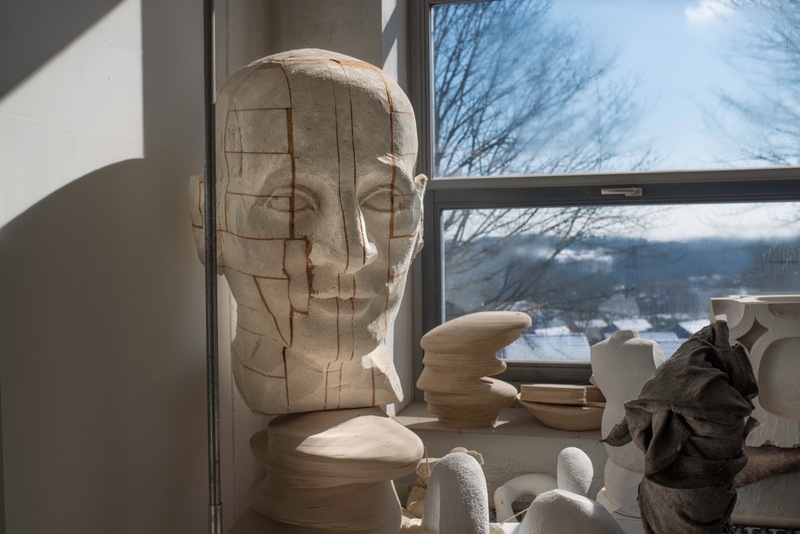 The human head, organic but with many intrinsic geometries. Numbered elliptical and circular plywood discs arranged in stacks. Wearing a dust mask is essential when sanding the surface of a sculpture. Layers of plywood developing into space like complex geological formations. 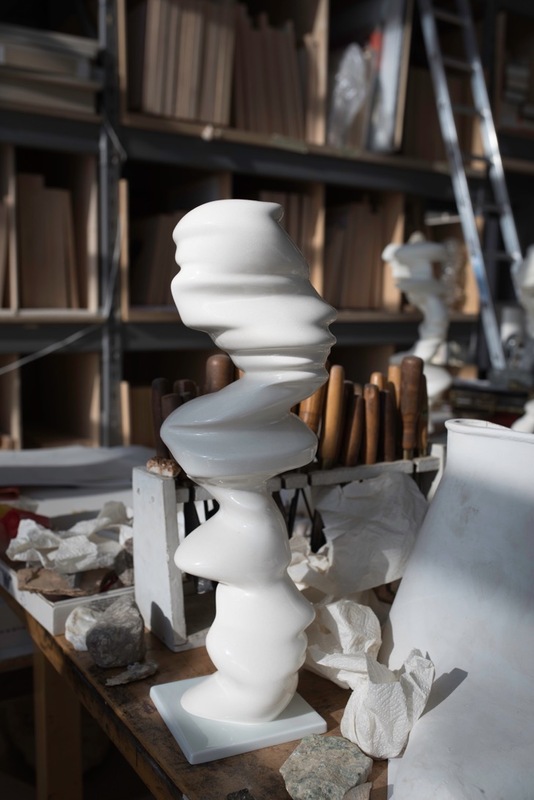 Tony Cragg’s version of a sunrise intended for the cathedral in Basel. Tony Cragg, examining a work belonging to his new series Hedges. Polystyrene and polyurethane are lightweight materials, that here become airy confections. A craftsman in a white laboratory suit, working with polyurethane. Not only is form important to Cragg, but also the information encrypted on the surface. Like the fossils that I find on his desk spread out like random paperweights, the sculptures are designed to reveal more upon closer inspection. “Literally, these are the fossils that I collected when I was a boy. The first fossil I found was when I was with my brother in our back garden when we were 8 years old. It was so bizarre and alien we could not figure out what it was. Geology shows you not just interesting shapes and forms. You hear about these paleontologists out in the desert who see this tiny little form in the ground and know that it is the tooth of an old hominoid. This ability to read the sculptural form in paleontology is an amazing human attribute.” From a distance the surface of Secretions seems to have a simple ivory skin. A closer look, though, reveals that in fact it is covered with thousands of plastic dice. Cragg had remembered Albert Einstein’s quote “God does not play dice with the universe” and that was enough to inspire the sculpture. “Einstein as a mathematician felt that there is no place for irrationality. He was wrong according to Heisenberg’s uncertainty principle, which is the basis of all art computing nowadays.” Cragg and his staff threw handfuls of dice into a basket and then placed them on the surface exactly as they rolled. Other series are covered with hooks, doorknobs or embossed numbers. Envelopes have a bronze skin pierced with holes while the surface of Early Forms contains information about the object that inspired it since for this family of pieces the artist sculpturally reforms familiar objects such as containers into new and unfamiliar forms. 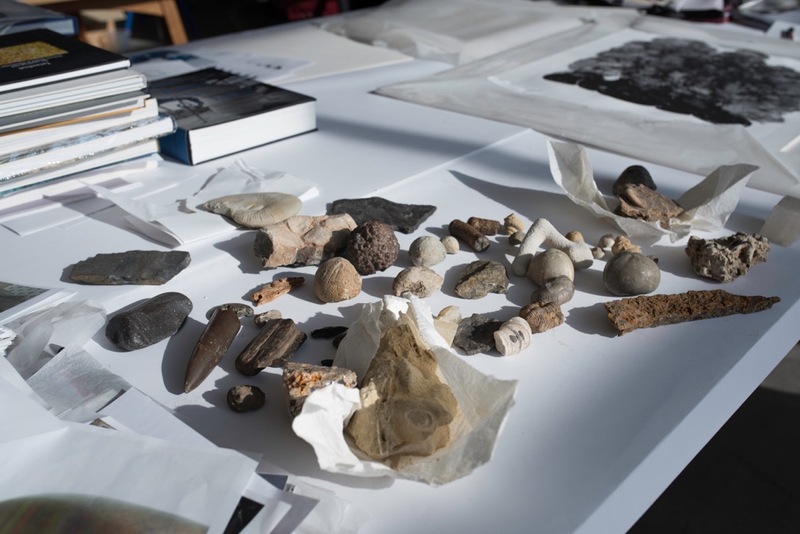 Tony Cragg’s childhood collection of fossils. Tony Cragg’s sketches are framed and arranged like books in a bookshelf. 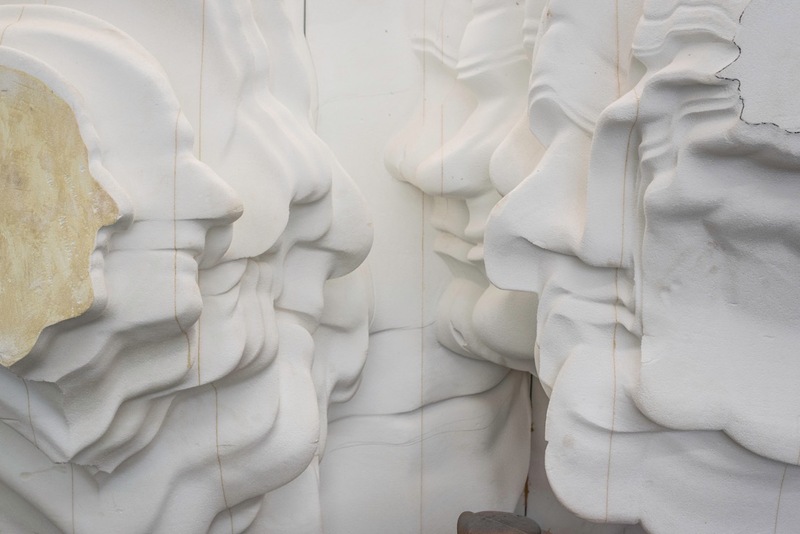 Confronting the surface with noses. Confronting the surface with faces. 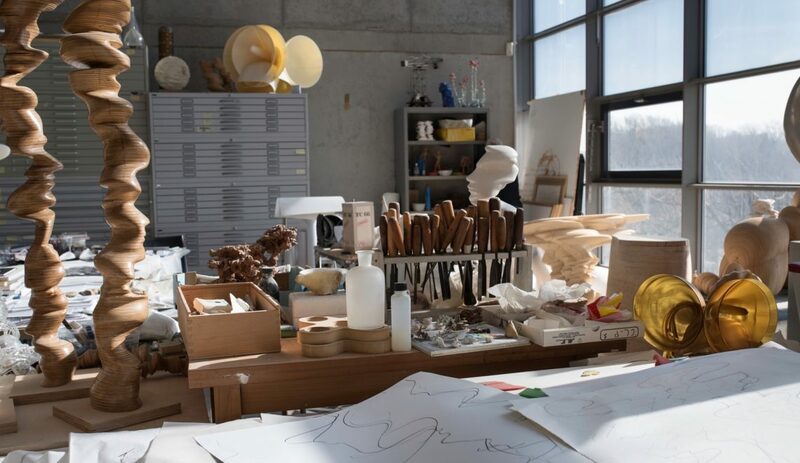 Works in a range of materials and techniques displayed in a white cubical gallery within the studio. 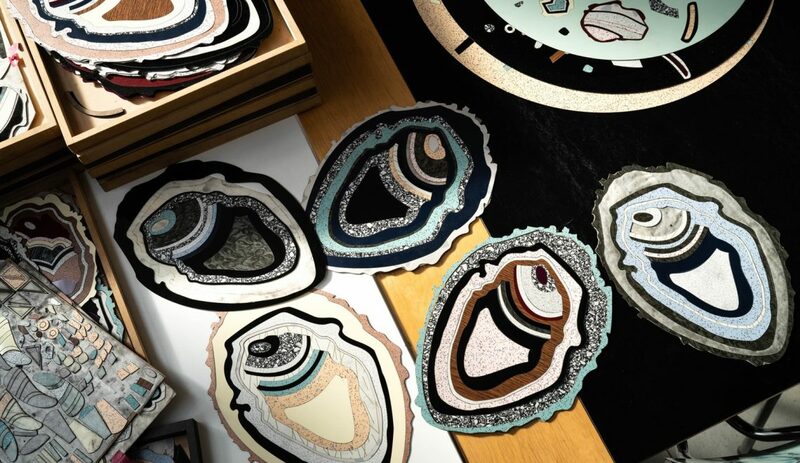 Larger works in various stages of completion. A bronze sculpture displayed outside the studio. Exterior view of the studio and works in bronze, a material that has lasted over thousands of years. A Henry Moore bronze waiting to be displayed in the park. 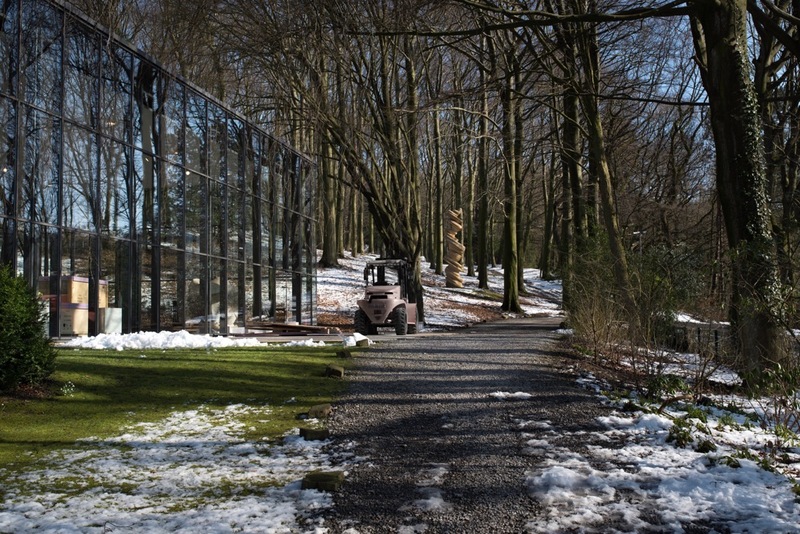 The glass gallery in Tony Cragg’s Sculpture Park, that currently hosts Henry Moore’s Plasters. 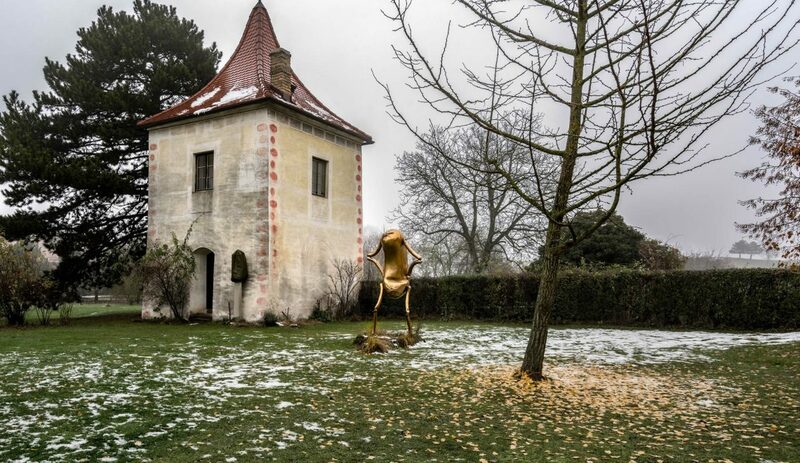 Tony Cragg’s Luke and Erwin Wurm’s Fat House. Amazing studio visit. Great writing.. I visited Tony Cragg’s show at the Lisson Gallery in London which I thoroughly recommend. I really enjoyed this article and the behind the scenes photos. What interested me is how he ends up with these forms. Hello Alexia, I live in Wuppertal and have been several times to the sculpture park. Now after having seen the studio and I would like to go back!